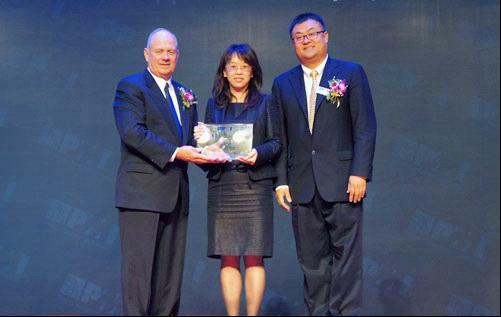 On September 15, Agricultural Bank of China Limited (ABC) became the first winner ever in China of the top PMI (China) Project Management Award – Annual Project Award – with its portal at PMI (China) Congress 2012. Project Management Institute (PMI), established in 1969, is a leading membership association on non-profit project management and a key advocate in the project management industry. Its Project Management Professional (PMP) credential has become a globally recognized certification for project managers. PMI has a membership of 500,000 and certificate holders in 185 countries. PMI (China) was established in 2008, and its Annual Project Award is the top award nationally in the project management field. ABC's portal encountered many difficulties such as limits of time availability, intricate and diverse content, and lack of specific quality standards. However, it is well designed to guarantee the success of its projects with scientific and efficient project management methods, especially the enhancements made in HR management, scope management, and quality management. Furthermore, ABC's portal also carefully fosters project-oriented management awareness among its team as part of its routine work, with remarkable achievements in this regard. Ever since the launch of its updated portal, ABC's page views have quadrupled. According to authoritative statistics, ABC's portal ranks among the top 60 domestic websites, and second among its domestic peers. More importantly, ABC's portal is becoming increasingly influential. Looking into the future, ABC will continue to enhance the building and operation of its portal, innovatively establishing leading service systems such as outlet/institution inquiry, life e-stations, wealth management e-stations, interaction e-stations and online business halls. All these play important roles in promoting high corporate profile, operational transformation, and all-around business development.